Nora Ephron '62 died from complications from the blood disorder myelodysplasia on Tuesday, June 26, 2012. Wellesley is deeply saddened by the loss of Nora Ephron, and our hearts go out to her family and those who were closest to her. With her formidable wit, provocative social observations, and magical gift with words, she touched countless audiences by providing a window into the often mystifying dance between men and women, and later, her wisdom on the tragic comedy of growing old. The world will remember Nora as a trailblazing writer and filmmaker whose talents and determination enabled her to succeed despite the odds in fields that were dominated by men. Never one to mince words, she is remembered by her friends at Wellesley as a quintessential truth teller—courageous, imaginative, tough, hilarious, smart, and compassionate. One lesser-known fact about Nora is that she wanted to write ever since she saw Lois Lane on TV. She began her career as an editor of the Wellesley News. 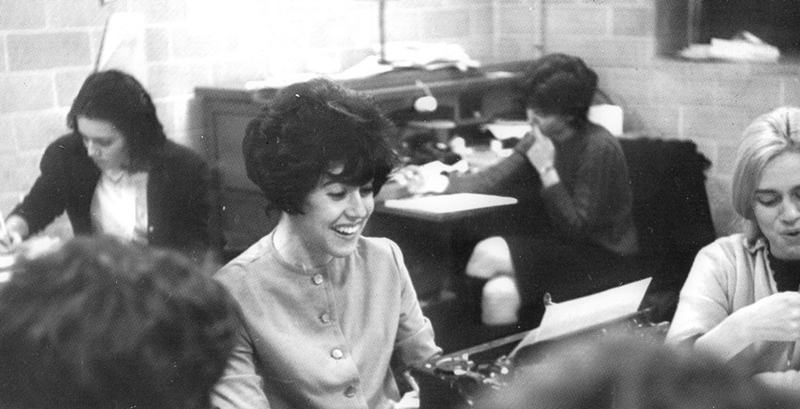 In a 1962 yearbook photo, Nora is seated at a typewriter at the center of the newsroom action, and she is laughing, looking like she is having a ball. When Nora was chosen by the Class of 1996 to deliver commencement remarks, she challenged Wellesley's graduating seniors: “Whatever you choose, however many roads you travel, I hope that you choose not to be a lady. I hope you will find some way to break the rules and make a little trouble out there. I also hope you will choose to make some trouble on behalf of women.” And when she returned to receive the 2006 Alumnae Achievement Award, Wellesley’s highest honor, she told students, “Prepare yourself for a life of confusion, and embrace it.” Nora embraced the world with a fierce and generous spirit. For those ideals, and for her sharp, empathetic, and irreplaceable sense of human nature and love, we will miss her terribly. Revisit two of Nora's most memorable speeches at Wellesley: her commencement address to the graduating class of 1996 and her acceptance speech for her 2006 Alumnae Achievement Award. Wellesley is not alone in honoring the life and work of Nora Ephron, or in feeling her loss.